The creative writing teacher, the delivery guy, the local Starbucks baristas, his best friend, her roommate, and the squirrel in the park all have one thing in common—they believe that Gabe and Lea should get together. Lea and Gabe are in the same creative writing class. They get the same pop culture references, order the same Chinese food, and hang out in the same places. Unfortunately, Lea is reserved, Gabe has issues, and despite their initial mutual crush, it looks like they are never going to work things out. Exactly what I'm in the mood for: quick, cute and fluffy romance. I love the idea of 14 povs, from the starbucks barista that intially hates Gabe, grumpy Victor, the romance-obsessed Inga, to a squirell and a bench on the campus (Yes, you read that right, a squirell and a bench). The story is light and realistic, about two people who's just too shy to admit that something is happening between them. There isn't any cheesy/typical YA words/scenes in this book. The problem is, sometimes I find it hard too connect with the main characters because I don't know what they're thinking. And sometimes I get annoyed with how the romance dragged on and on without any actions until the last few chapters, which potrayed in Victor's povs. Sometimess I just want to reach into the book, shake Gabe or pursue him to talk to Lea already. He's just so shy it's frustrating. 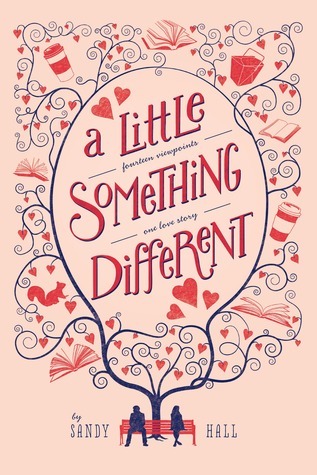 If you're in the mood for a light read and a cute romance, this is the perfect book for you. Your blog is the cutest fricking thing!